HP Compatible J9150A - Functionally Identical 10GBASE-SR SFP+ - Procurve 850nm Duplex LC Connector - Programmed, Tested, and Supported in the USA, Lifetime Warranty"
Marketing Information: As a pioneer to the compatible optics industry, ENET brings more than 10 years of experience with transceiver programming and development of compatible solutions. We offer the most complete line of OEM compatible transceivers spanning across 50 manufacturers. ENET compatible optics provide a cost-effective, 100% guaranteed compatible solution compared OEM products at a fraction of the price without sacrificing quality or functionality. ENET offers unparalleled quality by performing the most complete and comprehensive testing in the industry. Each optic is individually tested at 100% capacity in the latest network traffic generating equipment for latency, packet loss, frame errors, transmit power (Tx) and receive power (Rx). 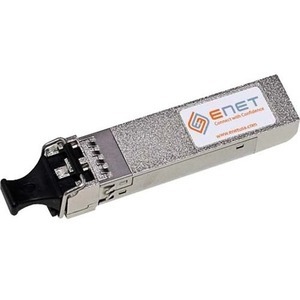 All ENET transceivers are individually serialized and programmed for their specific application and undergo testing in those specific platforms to ensure 100% compatibility and functionality. Programming involves specific values and algorithms to ensure proper operating software recognition and seamless integration with original OEM and other NON-OEM transceivers. ENET compatible transceiver solutions meet IEEE Standards for optimum performance and reliability as well as RoHS and MSA (Multi-Source Agreement) compliant for form, fit, and function in all MSA compliant switching and routing platforms. All ENET transceivers are backed by a lifetime warranty and are available in TAA compliant versions.